With ten years between the birth of the TeenTwins and The Boy, as well as an 11-year-old Tween five years younger than one and older than the other in the house maintaining the magic of Christmas MIGHT have been a difficult manoeuvre to pull off over the years. But, and this is the bit that baffles me, it hasn't. 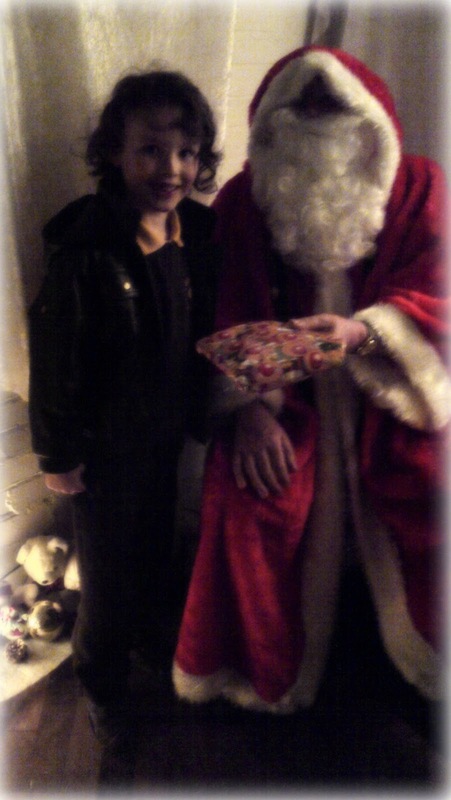 The Boy, aged six, believes in Santa with a six year old's hand-clenching, eye-shutting, watermelon-smile depth of belief. And, possibly worryingly, the TeenTwins and the Tween seem to believe with an equal surety. So how has this miracle of belief of Santa been pulled off you ask yourselves? And frankly, I'm buggered if I know. Though, at some point in the distant past, around about the time the TeenTwins started looking knowingly at the sudden increase of festive carrier bags arriving in the house mid-December, I told a lie. It wasn't THAT big a lie, but it was a lie nevertheless. And over the years that lie has grown and developed and become much like the Dragon Door, a family truth that isn't at all, er, true. My lie, the little one, so small to be practically white was, when challenged on the existence of Santa Claus by an inquisitive then-smaller TeenTwin, to be one of Santa's helpers. Not an elf OBVIOUSLY because there are some limits to which a child's imagination can stretch and me being an elf is not one of them. "It's a big world," I said, "You can't expect one man with a beard to do EVERYTHING, do you?" I may have tutted elaborately, looked a bit scathing and then changed the subject, quickly. "All mummy's the world over are, along with their newborn child, presented with a scroll inducting them into the Santa's Little Helper Club and there are rules. The first rule is never to tell anyone that you're a member of Santa's Little Helper Club. Obviously. "The Mummy Division of Santa's Little Helpers are the ones on the ground, the ones in the real world. The Santa Agent Special helper giving constant feedback to Santa headquarters on who does and who doesn't get a visit from The Big Man. We're the ones tackling the shops, in at the kill at the cash register, fighting for Christmas. "And I wouldn't be doing all that if Santa DIDN'T exist, would I? Now, go to sleep." And, strangely, they all seem quite happy with that. Well that and the flour and glitter wellington boot footsteps from the hearth to the tree on Christmas morning. And the half eaten carrot, crumbs of a mince pie and drained glass of sherry left on a plate. Oh, and the megafuckton of presents piled under the Christmas tree. ....Though sometimes, not often, but just sometimes I get the impression, fleetingly, that somehow, in some way SOME of them might just be, well .... humouring me. Ha ha, that's very cunning. I'm slightly worried that my 11yo, at secondary school, still believes, while my 6yo is asking ever more probing questions! Even though it's magical, I will kind of be glad when I don't have to keep the pretence up any more.